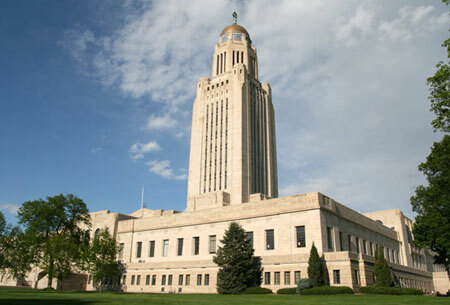 Nebraska state capitol in Lincoln. LINCOLN, Neb. — A bill that would prohibit Nebraska employers from discriminating based on sexual orientation has stalled in the Legislature. Lawmakers fell seven votes short of the 33 they needed to overcome an eight-hour filibuster by a group of conservative lawmakers and bring the bill to a vote. Senators voted 26-22 to end debate on the legislation. With four days left the session, the bill has little chance of returning this year. Sen. Danielle Conrad of Lincoln said she introduced the bill to protect workers from being fired because of their sexual orientation. Had the bill passed, Nebraska would have become the nation’s first solidly red state to ban discrimination based on sexual orientation. Sen. Ernie Chambers of Omaha introduced a similar measure in 2007, but it failed on a 24-15 vote. Nebraska’s two largest cities have already approved similar measures, though the ordinance in Lincoln is in limbo. The Omaha City Council passed an anti-discrimination ordinance in 2012 with a 4-3 vote. The Lincoln City Council later voted 5-0 on an ordinance, but opponents gathered enough signatures to place the issue on the ballot. The council has not acted. The state proposal advanced by the Judiciary Committee last month would apply to all public employees, government contractors, and private businesses with 15 or more workers. Religious organizations and colleges would be exempt. Lawmakers began debating the bill on Thursday, before adjourning for the weekend. Conservative lawmakers filibustered the bill through prolonged debate, arguing that it would hurt businesses owned by people who oppose gay relationships for religious reasons. Several pointed to the recent case heard by the U.S. Supreme Court, Hobby Lobby v. Sebelius, which has been viewed as a legal test of whether owners can discriminate against gays, lesbians, bisexual and transsexual people. Sen. Jim Smith of Papillion argued that the bill could saddle small businesses with tens of thousands of dollars in legal bills, even if lawsuits against them are later tossed out of court. Other senators said the bill would intrude on the religious beliefs of business owners.